In the days leading up to Norouz traditionally Iranians spend countless hours preparing for the arrival of the new year. During this time many homemade cookies are baked to offer to guests who come to visit. 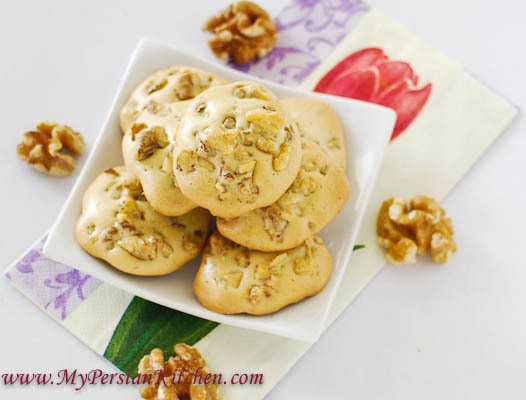 In today’s post I am featuring one of my favorite Persian cookies: Naan Gerdooee, Walnut Cookie. 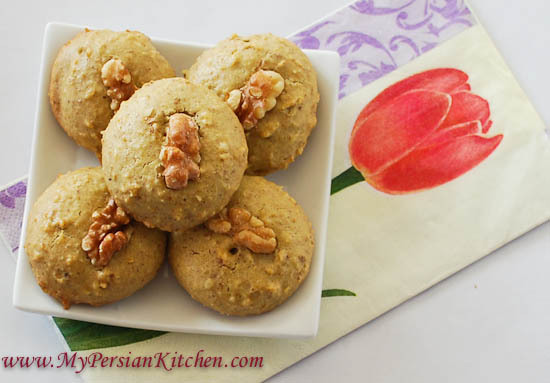 In addition to today’s recipe in this post you will find a Norouz Recipe Round-Up by 13 other fantastic Persian bloggers! I am pretty excited to have a community of bloggers to share our Persian New Year with this year! Now back to our cookies!!! The first time I made these cookies about ten years ago I was completely thrown off by the difference in look and texture from those purchased at the store. All the recipes that I have looked at state that the walnuts should be simply chopped. From the texture of the cookies at the store it is pretty clear that the walnuts are not chopped, but ground. So I experimented in the past and decided that the best texture in my humble opinion, and my tasters’, is when the walnuts are coarsely ground. The dough for these cookies is very simple and easy to make. 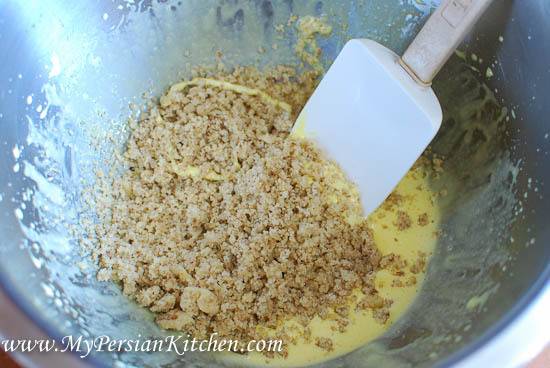 Of course there is the choice of making these cookies with simply chopped walnuts or coarsely ground. I am mainly featuring the ground walnuts option here. First turn over on to 300º. 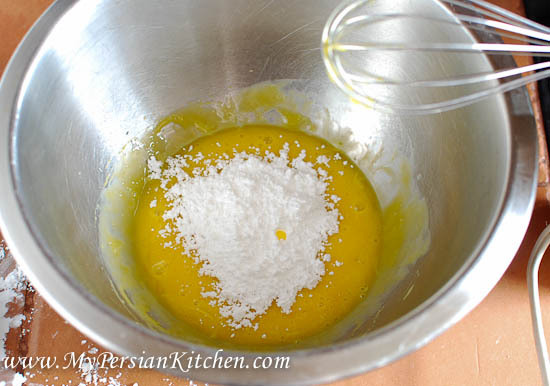 Place egg yolks in a mixing bowl. 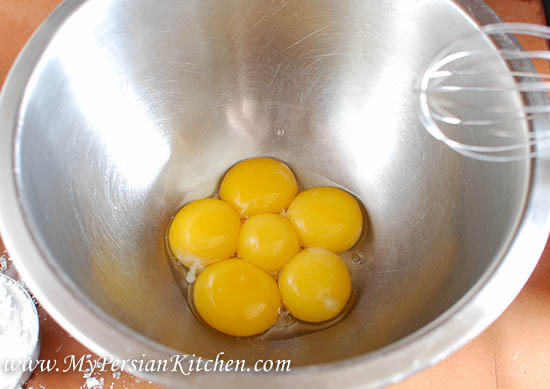 Using a mixer, whisk eggs together. 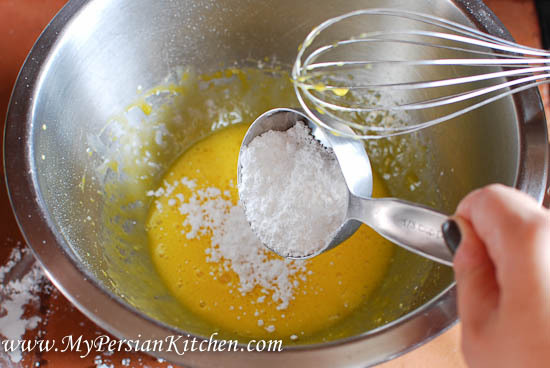 Add half of the powdered sugar to the eggs and whisk. 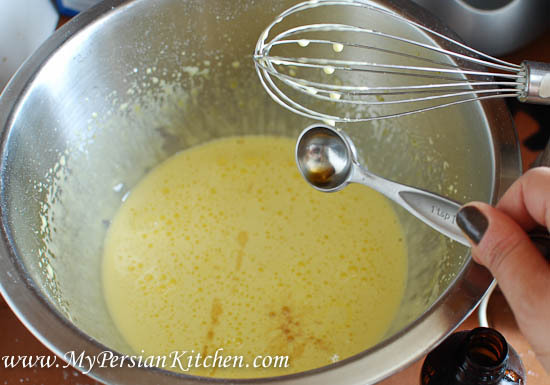 Add the other half and whisk with mixer for at least 5 minutes until the batter turns into a pale color and becomes creamy. Line cookie sheets with parchment paper. Using a small ice cream scooper, scoop batter onto cookie sheet making sure to leave about 2 inches between each cookie. Top each cookie with half of a walnut. If you do not have a an ice cream scooper, two tablespoons can be easily used to do the job. Bake cookies for 20 minutes. Remove cookies and place on a cooling rack. These cookies will be a dry on the outside, yet chewy on the inside. Store in an air tight container for later use. These look delicious! They will be part of my Nowruz cookie lineup!!! Thank you so much for organizing this recipe round-up!!! We love walnuts, so I must try your perfected recipe. Thank Sanam-jan, for getting us all together to celebrate Norouz. I think this is the beginning of a great tradition! Happy Norouz and hope to see you soon! They look absolutely delish! Next Mon/Tues are gonna be baking days. Thanks for everything! I have made fesanjun with pecans, I wonder if the same can be done with these cookies, I like pecans better than walknuts as they have less bitterness and are a bit more aromatic. 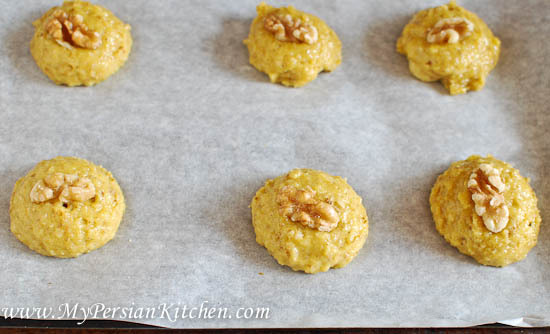 I am so excited to have discovered so many amazing Persian food bloggers. I found my way to your site through Louisa’s. I have been wanting to make walnut cookies and now I have the perfect excuse. These look delicious. Happy Norouz to you and your family! Dad would love these! Homemade is always so much better than store-bought. I made this recipe. So easy and so good! The hardest part was “store for later use.” Thanks! Sanam Joon! HALE MAMNOON barayeh een recipe! I have tried 3 others I found on the internet but they have all turned out wrong. THIS was the first time they came out delicious! Shoharam hale excited bood choon hale ali bood! Merci! Molly, so happy to hear that this recipe worked out for you! Woohoo! Have been wanting to make these for a while, easy to make and delicious to eat. I will be using alcohol-free Trader Joe’s brand vanilla and I wonder if the flavor will not come out because the quality of the vanilla is relatively lower. Perhaps I should add a full teaspoon? Sam, I usually use regular vanilla, so I have no idea how different is the flavor of the alcohol free vanilla.